In the Meantime...: writing on the hard days: beautiful things in his time. writing on the hard days: beautiful things in his time. Creativity is an overflowing of life for me. And when I “don’t feel like it,” it’s difficult to create, to design, to write. I love writing. More and more all the time it seems. But on hard days, it’s a struggle to get there. I don’t want to remember the junk and frankly, I think people have enough of that to read and deal with in life. Last week, God showed me something amazing. It’s like He was letting me in on a backstage tour of some of His recent top-notch work. I had coffee with a friend who was visiting from out of town. It’d been awhile since I’d seen her and I was thrilled to meet her new little baby girl. As I held this sweet angel in my arms, I looked up at her mama and reminded her where we were a year prior. Just months before, we were pleading with the Lord to bless her family with another child. Our eyes filled with tears just thinking about what God did in a year! 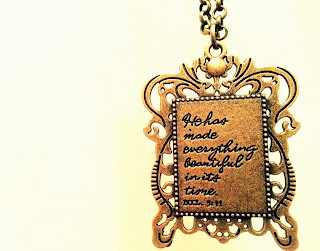 Beautiful things in His time. Later that day, a dear friend called me to let me know she was engaged! I knew it was coming and was so happy to celebrate with her. She’s a long-time friend whom I’ve had the wonderful privilege of walking with through the ups and downs, the uncertainties and unknowns of life. And we, too, had a moment of remembering the transformation of the past year and what God had done in her story in such a short time. God delights in redeeming stories; in working things out in ways we could never ask for or even imagine. (Eph. 3:20-21) I loved how He let me watch that happen and made sure I noticed His mighty work of the past year, twice in one day. After some days of not writing, I presented my struggle to the Lord in a conversation of prayer. “That’s just the point.” I imagined Him saying it with a smile. I know that sin runs too deep for hard days not to exist and that the resurrection of Christ is way too big for better days not to come. So today, trusting that God’s living and active promises are bigger than what I see and feel in this moment, I write. one sure step: how a marathon begins.